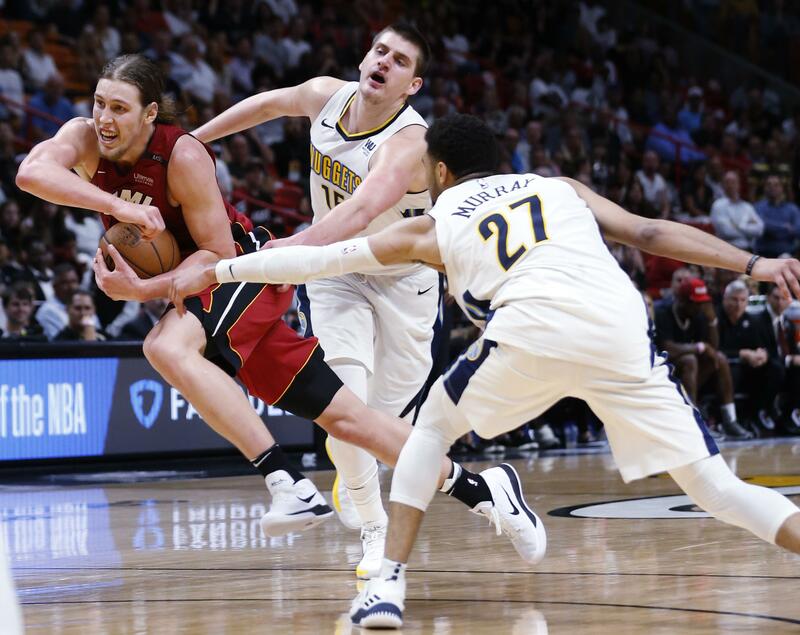 Mon., March 19, 2018, 11:08 p.m.
MIAMI – James Johnson scored a career-high 31 points, Kelly Olynyk added 30 off the bench and the Miami Heat set a franchise single-game scoring record by beating the Denver Nuggets 149-141 in double overtime Monday night. Miami’s total was also an NBA season-high and helped the Heat get back to the No. 7 spot in the Eastern Conference standings. Houston and Oklahoma City each scored 148 in games earlier this season. Wayne Ellington scored 23 points for the Heat. Nikola Jokic had 34 for Denver, while Wilson Chandler added 26 for the Nuggets. Neither team was at full strength. For Miami, Dwyane Wade (left hamstring strain) missed his fourth consecutive game, and Hassan Whiteside (left hip pain) sat out his fifth straight contest. Denver was without leading scorer Gary Harris, sidelined again by a strained right knee that could keep him out several more days. Denver led 16-5 after 3 1/2 minutes, and that was the only double-digit lead by either side for about the next three hours. It was airtight until the very final moments. CLEVELAND – LeBron James scored 40 points as part of his third triple-double in four games and Cleveland beat Milwaukee as coach Tyronn Lue began his leave of absence to address health issues. Lue said Monday in a statement he been dealing with chest pains and loss of sleep, and that tests have offered no conclusion about what the issue is. Associate head coach Larry Drew will run the team in Lue’s absence. James scored 17 points in the third quarter and finished with 12 rebounds and 10 assists for his 16th triple-double this season and 71st of his career. The four-time MVP took over in the third beginning with back-to-back 3-pointers. After not getting a foul called on a third attempt, he finished Cleveland’s next possession with a massive dunk. He was fouled attempting another dunk and made both free throws the following time down. SAN ANTONIO – LaMarcus Aldridge had 33 points and 12 rebounds, and San Antonio blew a 16-point lead to injury-ravaged Golden State before pulling away for a victory. The Spurs beat Golden State for the first time in four tries this season and won their fourth straight overall to move into fifth place in the Western Conference, one-half game ahead of idle Utah and New Orleans. Already without injured All-Stars Stephen Curry, Kevin Durant and Klay Thompson, the Warriors lost Draymond Green in the second quarter to a bruise in the pelvic area. Green took a knee to the groin while defending a drive to the basket by Danny Green. The Warriors weren’t getting any sympathy from a Spurs team that has played without Kawhi Leonard for much of the season. PHILADELPHIA – Joel Embiid had 25 points and 19 rebounds and Ben Simmons had a triple-double to lead Philadelphia over Charlotte. Simmons had 11 points, 12 rebounds and 15 assists to help the Sixers keep alive their shot at finishing fourth in the Eastern Conference and earning home-court advantage in the first round of the playoffs. The Hornets missed 17 of 21 shots in the third (1 of 5 on 3s) to crush their chances of stretching a seven-point halftime lead. INDIANAPOLIS – Victor Oladipo sparked a decisive run and finished with 20 points, Myles Turner had 21 points and Indiana recovered from a poor start for a victory over Los Angeles. The victory snapped Indiana’s two-game losing streak. Los Angeles was led by Kyle Kuzma with 27 points and Brook Lopez with 23, but the Lakers still lost their third straight. Oladipo and Darren Collison got Indiana going with back-to-back 3-pointers midway through the third quarter for a 77-70 lead. SACRAMENTO, Calif. – Blake Griffin had 26 points, nine rebounds and seven assists and Detroit pulled away in the third quarter to beat Sacramento. Ish Smith had 18 points, Reggie Bullock added 17 and Anthony Tolliver scored 12 points behind three 3-pointers – one of three Pistons with a trio of 3s. Andre Drummond had just four points but pulled down 16 rebounds to help Detroit end its three-game losing streak. The Pistons won on the road for only the 10th time this season. NEW YORK – Tim Hardaway Jr. scored 22 points and Michael Beasley added 17 as New York beat Chicago. Enes Kanter had 10 points and 13 rebounds, while Troy Williams added 11 for the Knicks. Cristiano Felicio scored a career-high 17 points for the Bulls, who were missing their top three scorers and went 3-for-30 from 3-point range. Bobby Portis and Antonio Blakeney scored 16 points apiece. NEW YORK – Allen Crabbe and Caris LeVert each scored 22 points and Brooklyn beat Memphis. Rondae Hollis-Jefferson had 16 points and 12 rebounds, and DeMarre Carroll scored 18 points for the Nets, who have two straight wins for the first time since Jan. 19-21. Andrew Harrison, who missed Memphis’ last nine games due to a right wrist injury, scored 19 points, and Brionte Webber had a career-high 15. The Grizzlies have lost 20 of 21. Published: March 19, 2018, 11:08 p.m.